Just a few blocks from Obama’s home in the Kenwood/Hyde Park neighborhood, Obama’s friend Marty Nesbitt lives across the street from the ornate yellow-gold home where Farrakhan lives. For the past two years, when Obama has brought his family over to Nesbitt’s home, the press pool bus parks near Farrakhan’s house. This usually does not cause a problem, but Saturday night — as most of the city was indoors watching the Chicago Blackhawks beat the Philadelphia Flyers in the Stanley Cup finals — a bit of tension emerged on Woodlawn Avenue. A pool report noted that as a dozen reporters and photographers following Obama stood on the sidewalk in front of Farrakhan’s home, someone’s foot touched the city-owned curbside grass. Soon he approached the secret service agent minding the press and asked him to move the van and its occupants. “How is this a security breach?” the agent asked. He asked if the house was government property. Neighbors all over Hyde Park and Kenwood have learned to deal with streets being blocked off and having to show ID to approach their own homes since Obama ascended to the presidency. The men filmed and photographed the reporters, the van and its license plates with their cell phones. The agent asked the reporters to go back into the press bus, which they did. 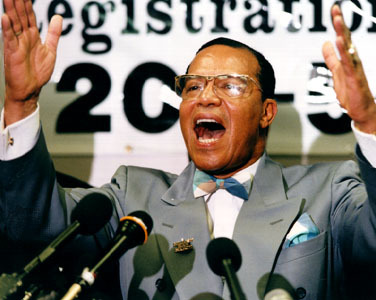 Before they did, some asked the Nation of Islam crowd if they could use the rest room in Farrakahn’s home.